You probably won’t be shocked to learn that death plays a part in a book entitled Rules of Murder. The main characters grapple with the violent deaths of people close to them, and these struggles are the catalysts for the changes they make over the course of the book. 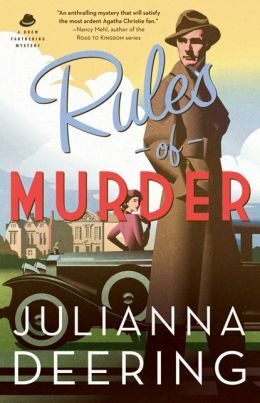 With a setting of 1930’s Britain, Rules of Murder is historical without being unfamiliar. Characters drive cars, listen to radios, and talk on telephones. However, the evangelical zeal that characterized Britain’s abolitionist and missionary movements of the 19th century have moderated into comfortable, routine religious practices. Drew Farthering, Julianna Deering’s (aka Inkwell’s own DeAnna Julie Dodson) charming amateur sleuth, is a prototypical English gentleman of his day—possessing a good education, good manners, and a good fortune. Oh, he still acknowledges the existence of a deity (unlike some of his Oxford professors and classmates), but he doesn’t particularly seek a relationship with God. He attends church—sometimes, at least. He’s a nice guy with decent morals. But his faith is an intellectual endeavor, not a transformation of the heart. He does the right things and knows the right lingo, and it all looks good—on the outside. In one sense, this propensity to pay lip service to our faith feels very modern, very relevant. Upwards of 80% of Americans claim Christianity as their religion, but fewer than half that number attend church regularly. The numbers are even worse in Drew’s Britain, where only about 0.5% of the Anglican church’s members actively attend weekly services. And while nearly 90% of Americans own a Bible (and most of those own more than one), only 13% read it daily. This desire to look good to others while still not surrendering to God is as old as humanity itself. A quick walk through the Bible produces example after example, from Cain in Genesis to the church at Sardis in Revelation. Do not be deceived, Paul tells us in Galatians. God is not mocked, for whatever one sows, that will he also reap. We may fool those around us, but God sees our hearts. And often he lets us reap the hypocrisy we sow. Secrets have a way of coming out in the end, and the sins we do in private often have a way of eventually bringing us down in public. If you don’t believe me, just go look at the headlines this week. They are full of salacious stories about several well-known politicians whose private lives will probably end their careers. In Rules of Murder, Drew learns several startling secrets about his family and himself, information that challenges his very concept of himself. Fortunately, rather than becoming cynical, he begins to evaluate his spiritual condition. You can read Drew Farthering’s story in Rulesof Murder by Julianna Deering. For a chance to win a free copy, leave a comment with a spam-proof version of your email address. Well done, C.J. Sad as well. While I occasionally feel ilke a functioning zombie, I'm also positive about what's really ALIVE in me now and my 'living forever' won't include walking around with that group of undead. I mean, why must zombies dress like that? Seriously, you are spot on with the state of the Christian church. In name only and even those who do have a true relationship with Christ we fall so short of what we could be. Well, Deb. The rest of the verses about Sardis talk about the reward of white gowns, so you won't have to worry about dressing like a zombie after you are dead. But trying to be (truly) alive in this life is a daily struggle for me. Spiritual zombie-hood. I love that term, CJ. Sadly it rings so true. I may have been there once or twice. It's not a good place to be. Thankfully, we have grace that covers us while we find our way back. And a spirit that nudges us so we do get busy finding our way back. I'm praying that spirit finds all the spiritual-zombies in my life and nudges them back into a strong relationship with God. "I mean, why must zombies dress like that?" Anyway, yeah, been there, done that. Still do that sometimes. Yes, Drew grapples with that "you have a name that you live, but you're dead" scripture for more than one reason. Great post, CJ. Thanks! Suzie, if you've only been in spiritual zombie-hood once or twice, you have my admiration -- and jealousy. DeAnna, I didn't want to give too much away by discussing the other reason that verse figures in the book, so I just stuck with the spiritual side.